Natalia Sorgente is an experienced litigator who provides strategic counsel on complex challenges at the intersection of law, policy and business. A partner in Katten's Environmental and Workplace Safety and Litigation practice groups, Natalia focuses her practice on civil and criminal litigation, internal investigations, and corporate compliance. 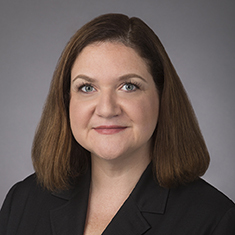 She draws on her diverse experience at the United States Department of Justice (DOJ) to partner with clients as a trusted resource that values business priorities. With deep-rooted relationships across the DOJ and with many government agencies, Natalia is armed with the experience to handle multiple agency involvement, provide thoughtful counsel and get exceptional results. Natalia joined the firm after serving at the DOJ, most recently as an Associate Deputy Attorney General to Deputy Attorney General Sally Yates. She has extensive experience working on high-stakes and high-profile trials, appeals, class actions, and negotiations, as well as Congressional and Office of Inspector General investigations. Natalia's keen insight into compliance matters stems from her broad interagency and interdisciplinary government experience, as well as a deep understanding of government practices and policy. Natalia also served as the Chief of Staff and Counsel to the Assistant Attorney General of the DOJ's Environment & Natural Resources Division, the litigating division with more than 400 lawyers handling civil and criminal environmental and natural resource matters on behalf of the United States. She played a role in many of the Division's most important cases, including the initial response to the Deepwater Horizon oil spill, and managed the Environment Division's international program. Earlier in her career, she was a DOJ trial attorney and represented, among others, the Environmental Protection Agency, the Department of Defense, the United States Army Corps of Engineers, and other government agencies on a wide range of complicated and highly technical environmental cases in federal district and appellate courts. A skilled advocate, Natalia also served as a Senior Counsel to the Assistant Attorney General of the DOJ's Civil Division, where she worked on significant civil and criminal cases, investigations, and appeals, as well as Indian law matters, policy, and legislation. In that role, she was instrumental in negotiating a class action settlement involving the use of a $380 million cy pres fund, and then in defending that settlement in district court and on appeal. Natalia worked with the Civil Division team and contributed to the government's successful defense in one of the most consequential cases arising out of the 2008 financial crisis. Natalia began her career as a law clerk to the Honorable Norma L. Shapiro of the US District Court for the Eastern District of Pennsylvania. She was then a litigation associate at a major law firm in New York and served in senior campaign roles during the 2008 presidential election. Shown below is a selection of Natalia’s engagements. With court-appointed monitor, oversee team of lawyers and experts tasked with monitoring a highly recognized, global cruise line subject to a negotiated plea agreement and criminal judgment in a case of arising out of international vessel pollution. Management of Civil Division’s policy efforts, including representing Division on working group; Congressional oversight; Office of Inspector General Investigations; and advancing Department and Division views on proposed legislation to amend FIRREA, ECPA and Federal Arbitration Act. On behalf of the United States, serve key role in the DOJ Civil Division’s litigation and appeal of a class action arising out of the government’s response to the 2008 financial crisis. Representation of the Department of Agriculture in settlement, and subsequent litigation and appeals, of a Native American farmer and rancher discrimination class action dispute regarding a $380 million cy pres fund. Representation of the EPA in the US Court of Appeals for the District of Columbia Circuit against a petition for review challenging three sets of transportation conformity regulations promulgated pursuant to the Clean Air Act. Representation of the EPA in the US Court of Appeals for the District of Columbia Circuit against petitions for review challenging its eight-hour NAAQS promulgated pursuant to the Clean Air Act. Representation of the EPA in the US Court of Appeals for the District of Columbia Circuit against two petitions for review challenging the EPA’s decision to list an industrial site on the Superfund National Priorities List under CERCLA. Serve as Chief of Staff & Counsel for the DOJ Environment & Natural Resources Division—a litigating division with nearly 700 employees handling criminal, enforcement and defensive matters in the areas of environmental and natural resource law, eminent domain, and Indian law. Work with leaders in the DOJ Civil Division on health care fraud, consumer protection prosecutions and enforcement actions, and government contractor tort claims. Representation of a food brand in litigation of issues related to allegations of deceptive trade practices and improper labeling in the olive oil industry. Representation of a global integrated business enterprise in criminal antitrust prosecution and related civil litigations. Representation of a major broker-dealer in the first “marking the open” market manipulation case. Representation of a major consumer product manufacturer in breach of contract litigation. Representation of an auto manufacturer in multiple litigations across the country concerning franchises and public-company ownership of dealerships. Representation of an issuer of variable annuities against alleged violations of the Investment Company Act. Representation of the EPA in challenge by group of municipalities of the EPA regions’ prohibition on blending by POTWs. Representation of the United States against suit alleging violations of CERCLA, OPA, CWA, FTCA and Indian Trust Doctrine. Representation of the United States as lead counsel in a major CERCLA litigation involving contamination at a former US Army Airfield. Representation of the United States in a significant CERCLA litigation involving contamination at a former industrial site used to make ammonium perchlorate for the government during World War II. Representation of the United States in RCRA and NEPA challenge to Army Corps of Engineers lock replacement project.